The idea of a wolf pack leader, usually called an alpha, who leads the pack by force and must fight off challengers to his position or die, is ingrained in our culture. For decades this was accepted as fact. However, this was based on research done on wolves in captivity; recent studies prove different. When the old pack leader loses a challenge for dominance, he often becomes a beta wolf in the pack. According to David Mech, a senior scientist with the U.S government's Geological Survey Biological Resources Division, wolf packs do have a structure. In the wild, that structure is based around the wolf family. A wolf pack is mostly related with the parents acting as the alpha male and female. In time, as a pack grows and unrelated wolves are allowed to join, the alpha male and female are the wolves who are the parents to the majority of the pack. The alpha male and female are usually the only ones with the right to breed in a pack, though very large packs may have multiple breeding pairs. In this case, the eldest breeding pair is likely dominant. Isle Royal, a wolf sanctuary in Michigan, explains that when a pack is stable and the young pups have grown to maturity, they may stay in the pack as subordinates or betas. Beta wolves eat after the alphas and generally do not breed. 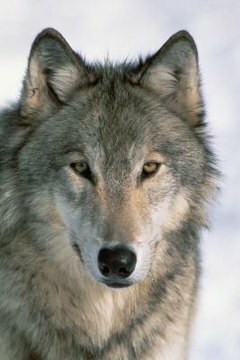 If a beta wolf wants to breed, he leaves the pack (called dispersing) and becomes a lone wolf. A lone wolf will wander, often traveling on the outskirts of the territory of other packs, trying to find mates to start his own pack. Being a lone wolf is dangerous, as most alpha wolves will kill intruders to protect their pack. David Mech explains that wolves do not have a great deal of dominance behavior within the pack; many of the identified behaviors are food related. Wolves will beg for food from each other as an act of submission, but research indicates the submission may be just as significant as the dominance and have more to do with promoting relationships than actual pack rank. They also occasionally will try to steal food from each other, especially as pups. Alpha wolves in a pack are the only ones who scent mark, for any other wolf to do so is considered a challenge to the alpha's dominance. When wolves within a pack fight over a dominance issue, the fights are usually highly ritualistic. Fights are more bluff and showing off than actual attempts to hurt each other. Sometimes, most often in winter, fights will turn deadly but usually the loser simply walks away from it uninjured. Wolves usually lose and gain rank (such as who eats when, or who leads when traveling) frequently within their pack, with some of the more peaceful packs almost passing rank around like a game, taking turns.